Marisa Perry is an authorized dealer of Royal Asscher, the most beautifully cut Asscher cut diamonds in the world. Cut for maximum brilliance, they reflect more light than any other Asscher Cut. 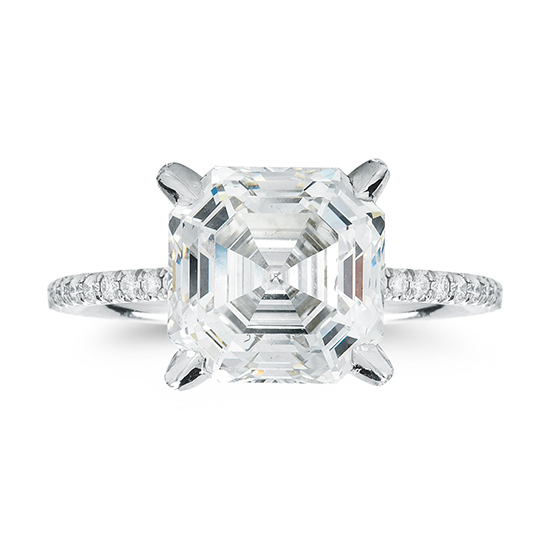 In 1999, Edward and Joop Asscher became intrigued with the possibility of enhancing their Great-grandfather, Joseph Asscher's design for the original Asscher Cut. Diamond cutting has advanced significantly since 1902. With the inception of computer modeling and simulation, diamond cutting now offers fresh insight into the age-old art. After two years of intensive research and consultation with their master polishers, Edward and Joop presented the Royal Asscher Cut as a successor to the Asscher Cut. The diamond is perfectly symmetrical, with proportions that fall within strict parameters; every facet is measured for absolute accuracy. The Royal Asscher Cut has a high crown and 74 facets - whereas the modern square-emerald cut and the original Asscher both have 58 facets.